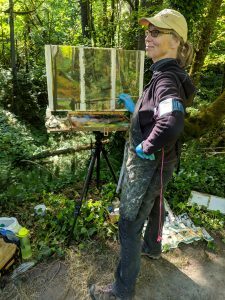 I’ve begun a large project where I will be painting outdoors at a local park; Priest Point Park, Olympia, Washington over the next three months. I’m calling it “She’s Making a Painting”. This photo shows me at work on the preliminary study for the larger painting which will be comprised of three canvases, each 9′ X 4′. The triptych will be 9′ X 12′, my biggest painting to date. This site is a beautiful spacious view of a ravine that is loved by me and many park users who pass it on the way to a trail head. Along with the beauty, there is a slow creeping problem; English Ivy. By painting here I hope to call attention to the the challenges our local parks face: invasive plants. I will work with the City’s Park Ranger to organize a volunteer ivy removal team to go into the ravine to help reclaim its glory, returning it to a healthy forest that will thrive and flourish.